At Affordable Rent-A-Car And Sales, we understand that sense of style is subjective, which is why we offer our customers a wide variety of car rental options to choose from. From compact cars to luxury sedans, our rental fleet is comprised of many types of cars for rent. When travelling in UT, make sure you and your vehicle see eye to eye. Contact our Salt Lake City office at (801) 266-7368 today to obtain a quote, or submit a reservation for the vehicle of your choice. Making decisions can be difficult, but they are necessary. Why be stuck with a compact car when you need the room of a full-size vehicle? Why pay extra for a luxury car rental when a midsize sedan or standard car suits your needs best? At www.affordablerentacarandsales.com, we give you the option of choosing what you need most. Economy Cars: Smaller than our other cars, a compact or cheap car rental is the lowest priced vehicle in our fleet. Those on short business trips into Salt Lake City, Utah, or needing a temporary insurance replacement will find this is perfectly suitable for their day-to-day obligations. You’ll save money on gas expenses and feel good about driving an eco-friendly vehicle also! Midsize Cars: Steps above a compact car in terms of size, these midsize rental cars offer space and comfort, while keeping you within your budget. If you have more than one traveler, but don’t need a vehicle for an extended amount of time, this would be the perfect choice for you while still being fuel-efficient. Standard Cars: Standard car rentals push full-size space into a budget-friendly exterior. Smooth and comfortable, the ride to any of your destinations will have legroom for up to five passengers and trunk space for everyone’s luggage. Full-size Cars: The largest options are often the best solutions for those longer trips into Utah. If you’re likely to spend more than a few days in the city on business or are waiting to purchase a new vehicle, make the right decision and rent a full-size car. Luxury Cars: Premium sedans this luxurious and spacious help you impress clients, strangers, and friends. Lush seating, modern amenities, and style to beat the band, each luxury model in our fleet helps you differentiate yourself from the sea of monotony on the road in Salt Lake City, Utah. Contact a Rental Agent Today! 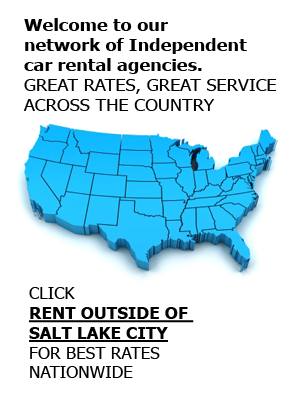 As a family-owned and locally renowned SLC car rental business, we make sure each customer that rents from us leaves completely satisfied with our services and vehicles. Whether you need a car rental, van rental, truck rental, or SUV rental, you can expect dedication from reservation to the vehicle’s return. Take advantage of our courtesy airport delivery services and door-to-door shuttle when renting for added convenience. Contact us today at (801) 266-7368 to speak about our car rental services and options, as well as to purchase a used vehicle or rent one for a production shoot.